Narrow your search by selecting the number of zones, load types, etc. Send your completed worksheet to clcquotes@crestron.com or call 855.644.7643 for assistance. Offers effective and powerful lighting control for small-sized spaces providing automation based on natural light and presence of people within the space. This system also supports expansion modules for more load types. Ideal for medium-sized spaces needing switching and dimming that require additional options such as expansion modules for more load types, touch screens, additional sensors, and shade and AV integration. 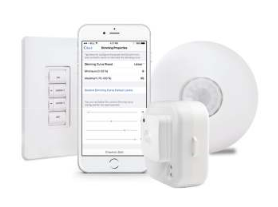 The GLZUM SpaceBuilder system is an ideal wireless lighting control system for any space, whether new construction or in retrofit installations. It provides dimming, switching, motion sensing, keypad control, and plug load control. Each GLZUM space can support up to 32 Zūm™ devices. 0-10V, phase, relay, and plug load control. Pre-pairing option for quicker installation. Expansion into dual tech and specialty sensors. Ideal for medium to large spaces that need flexibility to reconfigure zones, adjust color temperature, or control ambient and task lighting with the same space. It is also a great choice for applications requiring scene-based control when loads are fed from multiple sources. Options such as expansion modules for more load types, touch screens, and shade and AV integration are also available. Perfect for spaces such as retail stores, small office spaces, parking garages, and service stations, which typically require only ON/OFF switching. Compact yet versatile, it eliminates the need for an expensive switching panel. The GLDMX SpaceBuilder system is ideal for controlling large amounts of DMX lighting typically needed in lobbies, exteriors, banquet halls, restaurants and other entertainment venues. This system is also perfect for small to medium sized theaters and auditoriums or any space needing integrated control of theatrical and architectural lighting in the same space. Your selections fall outside of the SpaceBuilder solution, please contact Crestron at clcquotes@crestron.com or 855.644.7643 for assistance in creating a custom specification and quote. All SpaceBuilder systems are easily networked to provide centralized monitoring, management, BAS integration, master time clock and master control. Use the following SpaceBuilder options as add-ons to any SpaceBuilder system to enable networking. The GLNET-CN provides a convenient pre-assembled lighting control cabinet for commercial lighting applications that do not require scheduling. Pre-assembled lighting cabinet for Crestron lighting control. For commercial applications that do not require scheduling. Contains a 3-Series automation processor, Cresnet power supply, and 5-Port PoE Switch. The GLNET-ZUM provides a convenient pre-assembled lighting control cabinet for a Crestron® Zūm™ commercial lighting system. Pre-assembled lighting cabinet for Crestron Zūm lighting control. For commercial applications running entirely on the Zūm platform. Contains a Zūm Floor Hub and 5-Port PoE Switch. Enables centralized management and time clock for up to 200 individual rooms. Enables integration with non-Zūm Crestron systems and devices. The GLNET-ZUM-CN provides a convenient pre-assembled lighting control cabinet for commercial lighting applications that combine Crestron Zūm with other Crestron systems and devices. For commercial applications combining the Zūm platform with other Crestron systems. Contains a Zūm Floor Hub and 3-Series automation processor. Includes two Cresnet hubs, two Cresnet power supplies, and two 5-Port PoE Switches. The Crestron CLP-HUB-SW-POE-5 is a preassembled expansion panel that provides additional Ethernet connectivity, and was designed for use with the Crestron GLNET-CN, GLNET-ZUM, and GLNET-ZUM-CN Lighting Control Processor Panels. The Crestron CLP-HUB-SW-POE-5 contains a DIN-CEN-CN-2, a DIN PWS60, and a CEN-SW-POE-5 in a DIN-EN 2X18 cabinet. For additional details and specifications, refer to the individual spec sheets for each component. Pre-assembled expansion cabinet for Crestron lighting control. Expands the Ethernet capacity of the Lighting Control Processor Panel to which it is connected. Works with Crestron GLNET-CN, GLNET-ZUM, and GLNET-ZUM-CN Lighting Control Processor Panels. The Crestron CLP-HUB-SW-POE-10 is a preassembled expansion panel that provides additional Ethernet connectivity, and was designed for use with the Crestron GLNET-CN, GLNET-ZUM, and GLNET-ZUM-CN Lighting Control Processor Panels. The Crestron CLP-HUB-SW-POE-10 contains 2 CEN-SW-POE-5 in a DIN-EN 2X18 cabinet. The Crestron CLP-HUB-SW-POE-16 is a preassembled expansion panel that provides additional Ethernet connectivity, and was designed for use with the Crestron GLNET-CN, GLNET-ZUM, and GLNET-ZUM-CN Lighting Control Processor Panels. The Crestron CLP-HUB-SW-POE-16 contains a DIN-CEN-CN-2, a DIN PWS60, and a CEN-SW-POE-16 in a DIN-EN 6X18 cabinet. Additional resources can be accessed via the Crestron Commercial Lighting Consultants Partner Portal at http://www.crestron.com/about/partner-info/commercial-lighting-consultants. For assistance with incorporating this product into a design or specification, please contact the Commercial Lighting Consultant Hotline via email at clcdesign@crestron.com or by calling 888-330-1502.